Thanks to Ryan Fitzpatrick and a talented collection of playmakers that include DeSean Jackson, Mike Evans, O.J. Howard and Chris Godwin, the Bucs (2-0) are off to their best start in eight years and have the NFL's top-ranked offense. The Tampa Bay Buccaneers are not only thriving in the suspended quarterback’s absence, they’re evolving into an offensive juggernaut that’s set to perform on a national stage when the Pittsburgh Steelers visit Monday night. Thanks to Ryan Fitzpatrick and a talented collection of playmakers that include DeSean Jackson, Mike Evans, O.J. Howard and Chris Godwin, the Bucs (2-0) are off to their best start in eight years and have the NFL’s top-ranked offense. The Steelers (0-1-1) are not far behind at No. 2, however inconsistency on defense has Ben Roethlisberger and Co. winless through two weeks. “I respect what they’ve done. I’m not so sure I’m surprised,” Steelers coach Mike Tomlin said of Tampa Bay’s emergence with wins against the New Orleans Saints and the reigning Super Bowl champion Philadelphia Eagles. 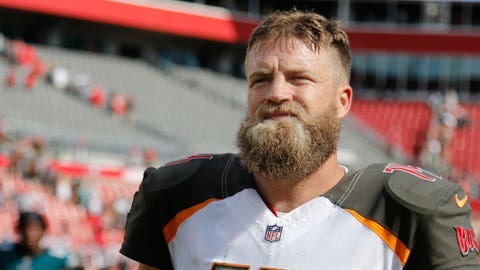 They’ve done it with Fitzpatrick, a 35-year-old journeyman who has thrown TD passes for seven NFL franchises, delivering the best two games of his career. “Man, he’s got some explosive weapons. He’s stepping in for Winston, but Fitz is not a step-in guy. This guy has started in multiple cities,” Tomlin said. What once looked as if it might be a potentially disastrous stretch to open the season with Winston suspended three games for violating the NFL’s personal conduct policy suddenly is an opportunity for the team’s first 3-0 start since 2005. Very encouraging for a franchise that has missed the playoffs 10 consecutive seasons, the second-longest drought in the league behind the Cleveland Browns (15). Fitzpatrick believes he’s playing the best football of his career. As well as things are coming together for the Bucs, though, it’s been rocky times for the struggling Steelers, off to their worst start in five years. And star receiver Antonio Brown made headlines after shouting at offensive coordinator Randy Fichtner on the sideline last week and then responding to criticism on social media from a former team employee by suggesting the team trade him if it wants to find out how productive he can be without Roethlisberger. “We are two weeks in. We do not have a large body of work. We are focused on winning this next opportunity,” the coach said. All the self-created melodrama surrounding Brown has overshadowed another significant development for Pittsburgh’s offense: the continued rise of second-year wide receiver JuJu Smith-Schuster. The 21-year-old came on strong over the second half of his rookie season in 2017 and has picked up right where he left off. Smith-Schuster is tied for Brown for the team lead in receptions (18) and his 240 yards receiving ranks fifth in the league. “He just has a great knack and feel for the game, knowing when to sit down in zone, knowing when to move in man,” Roethlisberger said. Hall of Famer Tony Dungy, who won a Super Bowl as a player with the Steelers and later transformed Tampa Bay from a laughingstock into a championship contender as a coach, will be inducted into the Bucs’ Ring of Honor during a halftime ceremony. He joins Hall of Famers Lee Roy Selmon, Warren Sapp and Derrick Brooks, as well as Doug Williams, Jimmie Giles, Mike Alstott, John Lynch, Paul Gruber, coaches John McKay and Jon Gruden and late owner Malcolm Glazer as members of the ring. The Steelers have made it a habit of stubbing their toe early in the season only to find their groove at midseason and reach the playoffs each of the past four years. Not that their resiliency has provided them any sort of comfort facing the club’s worst start since 2013. Defensive breakdowns and Brown’s behavior aren’t Pittsburgh’s only problems. The Steelers have hurt themselves under an avalanche of penalty yards. Pittsburgh has been flagged 24 times for an NFL-high 206 yards in penalties through two weeks. Tomlin described the issues as “popcorn,” meaning they’re coming from all over the place. If there’s a bright side for the Steelers, it’s that they’ve found a way to clean things up as the season progresses. A year ago they were called for 23 penalties through two games and finished with the ninth-fewest penalty yards in the league.